Nokia introduced a new family of smartphones, the Nokia X series of phones. The first three phones in the family - the Nokia X, X+ and XL - run on the new Nokia X software platform, that is based on Google's Android. The phones under the Nokia X family are not pure Android phones; these phones instead run a forked variant of Android, similar to the way Amazon does for its Kindle Fire lineup. Nokia has taken the open-source elements of Android and has pulled in other elements of Asha and Windows Phone to offer users a different experience. The downside here is that Nokia X users can't have access to the Google Play Store for apps. However, the phone will run Android apps, but Nokia will curate a list of such apps. A recommended source for the apps is the Nokia store, says the company. In other words, the new platform, Nokia X, is based on the Android Open Source project (AOSP). Nokia ditches many of the Google services that come with Android, which Google lets phone makers customise at will. Instead, the new Nokia X phone announced will emphasise Microsoft services such as Bing search, Skype communications and OneDrive file storage. Its home screen sports larger, resizable tiles resembling those on Windows phone. Nokia X, Nokia X+ and Nokia XL form a new family of Nokia's affordable smartphones. The Nokia X is the entry-level model in the family, will cost 89 euros, and will be available immediately in select markets. The Nokia X+ offers more memory and storage. It's priced at 99 euros and will be available in early Q2 2014. Finally, the Nokia XL packs a 5-inch screen, 5 megapixel rear-facing and 2 megapixel front-facing camera. It will be priced at 109 euros and be available in early Q2 2014. These phones feature a brand new, tile-based home screen. The new OS also reintroduces a redesigned version of its Fastlane notifications centre - a second Home screen if you like - from the latest Asha devices. 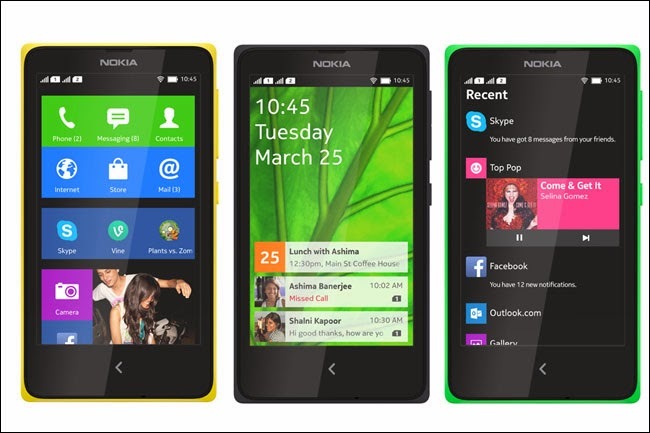 "The X family boasts Nokia's exciting, high quality hardware design and a range of bright colours. The brand new, tile-based Home screen offers you a simple, elegant way to manage your apps and phone functions and also reintroduces a redesigned version of the enormously popular Fastlane notifications centre - a second Home screen if you like - from the latest Asha devices," said Nokia. Here Maps with turn-by-turn navigation and offline maps are also included. Free cloud storage from Microsoft OneDrive with 7GB of space for free is included out of the box. There's also access to Outlook.com as your email service. And there's Skype with a month's free calls to international landlines in selected markets. At launch, leading global apps will be available for the Nokia X family of devices, including Facebook, LINE Free Voice and Messages, LINE Camera, LINE Bubble, Picsart, Plants vs Zombies 2, Real Football 2014, Skype, Spotify, Swiftkey, Twitter, Viber, Vine and WeChat, among others. And in a first for Nokia customers around the world, BBM will also be available on the Nokia X family of devices in addition to Windows Phone. Jussi Nevanlinna, Nokia's vice president for product marketing, said the Finnish company is positioning the Nokia X as a bridge to high-end Windows smartphones under the Lumia brand.